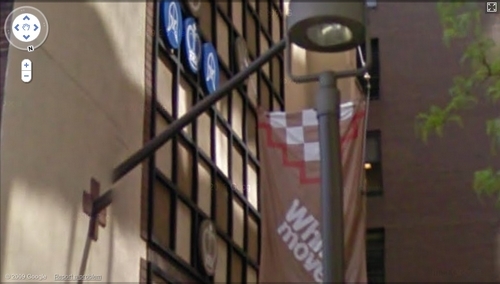 World's Largest Chessboard can be found at 767 Third Avenue, on the corner of an apartment building on East 48th Street, Turtle Bay, Manhattan, NYC, USA. The 40-storey skyscraper known as "767 Third Avenue" is recognized as one of the Manhattan's signature buildings. 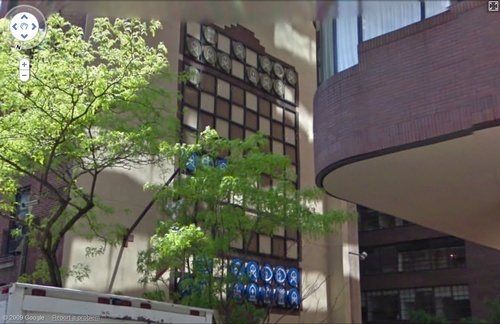 During its development in the early eighties, the developers, Kaufman brothers (Melvyn and Robert) were not very happy with the blank cemented wall of adjacent 9-storey apartment building on the East 48th Street. They therefore affixed a tall grid of metal beams on the blank wall of the nearby apartment and created a giant vertical chessboard. The public art chessboard is 3 stories high and the chess pieces are 2-1/2 feet flat discs. The chessboard, which is in use since 1982, features famous historical chess matches between world champions and a move is made every Wednesday noon when a workman goes up in hydraulic cherry picker to make the next move. A flag nearby indicates throughout the week, which colour is to move next. Information about the game in progress is also available in the lobby of the building and few small wooden tables are also placed below the board so that the enthusiast can play their own game. Reportedly few years back some companies had offered free coupons of their merchandise for guessing the next move. I am not aware if such a scheme is still in vogue or not. Credits: I am thankful to Eddie Kilkenny who e-mailed me info about this Giant Chessboard - Thank you Eddie.